Microphotography can be challenging because it involves moving in close and magnifying what is there beyond our normal perception of it. As a consequence, we need to pay a lot of attention to every detail we see in the view finder because it will have a huge impact on the overall look and feel of the image. Where we place the subject in the frame (i.e. composition) is critical; even the smallest movement left-right, up-down, can substantially change its impact. It’s hard to overstate the importance of composition. For all of the emphasis we as photographers tend to place on which camera, lens or other gear to use, there’s nothing that contributes more to a pleasing image than careful attention to the framing of your subject. In this article I’m going to discuss some of the compositional techniques most applicable to microphotography. Microphotography is the extreme form of macrophotography, dedicated to the photography of small objects from life-size to modest enlargements of up to about 20. Working with these large magnifications means that the subject is only a few centimeters in front of the lens. Shooting from eye level allows the photographer to show the subject as if looking at it from within the subject’s own world. Springtail with a size of around 1.0 mm: Magnification 12, f/6.4, ISO 100 and 1/250 sec. Taking your photos from a unique viewpoint is a microphotography technique that you should try to use. Imagine yourself admiring the insects flying around or walking upon the petals and blossoms of the flowers in your garden. 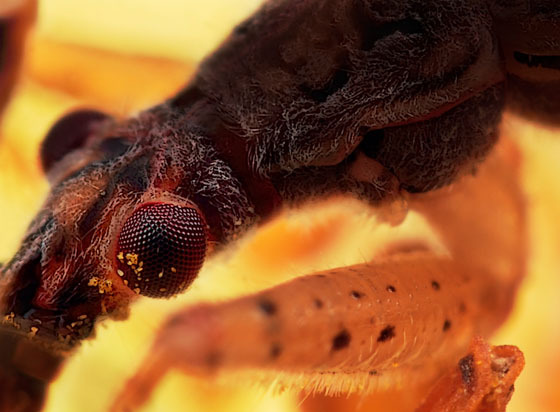 When you are looking at these insects, you are always looking from a top-down perspective. As such, if you take a photo from the same viewpoint, it is not unique and doesn’t captivate the attention of your viewers. Shooting extremely close at eye level allows you to show the subject as if looking at it from within the subject’s own world. It makes insects seem man-sized and look more threatening than an elephant or bison. 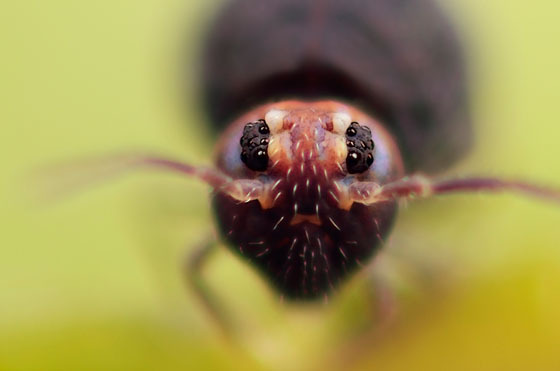 Many times macro photographers put too much effort into capturing their subjects “head-on.” Think outside the box and experiment with different angles to create a unique perspective. This helps to capture the attention of your viewers and draw them into the microphotography world. Including the whole body would mean shooting at a relatively small magnification ratio. Portrait of a ladybird: Magnification 8, f/11, ISO 100 and 1/250 sec. The increase in magnification reduces the depth of field in an image, decreasing the total area of the image which is in sharp focus. This provides another disadvantage. The reduced depth of focus makes it more vital to think about composition and selecting which area to place the most focus on. Magnifying the image also magnifies any movement of the camera and the subject, so it becomes far more challenging to make super sharp images. Even with all the limits of insect photography, photographers have found ways of getting around them and producing vivid images. There is an inverse relationship between magnification and depth of focus. To make up for the limited amount of depth of focus, photographers are more careful of what areas to include in the final image. Composition is a key element to insect photography. 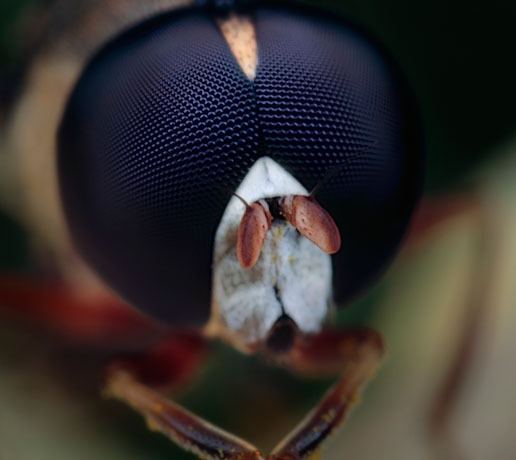 In most cases, we want good focus and sharpness on the eye of the insect that we’re shooting. But with depth of field of less than a fraction of a millimeter, getting any part of the animal in focus can often be quite a challenge. When deciding whether or not to include a subject’s entire body, one guideline to remember is to ‘cut hard or not at all.’ It’s often problematic to include the whole subject in a frame. Apart from anything else, some insects have very long antennae, so including the whole body would mean shooting at a relatively small magnification ratio. Capture the aspect which makes the insect unique. If it is the insect’s mandibles, then compose the image to show the insect when it is eating. For maximal sharpness throughout, adjust the angle of your camera so that the plane of sharpest focus aligns with the head/plane of your subject. Play around with composition until you get something that works. Insects are also known to be jumpy. Knowing the behavior of the subject is needed to determine how to best approach and how to capture the image without scaring the insect away. It also pays to be patient, allocating a significant amount of time to photographing insects. Magnification describes the relationship between the actual size of the subject and the size of its image on the sensor of the camera. Dividing the size of the subject’s image on the sensor by the actual size determines the magnification. At 1:1 life-size, the size of the subject on the sensor is as big as it is in real life. The amount of look room necessary is dependent upon the angle of the subject to the camera. Cheilosia female hoverfly: Magnification 8, f/11, ISO 100 and 1/250 sec. The concept of ‘look room’ and ‘headroom’ are important in microphotography as well as other wildlife photography. Well-composed shots leave space in the direction the insect’s eyes are looking. Indeed, having a subject looking at the nearest edge of the frame can be unappealing. If you don’t leave enough look room, your subject will appear to be boxed-in and confined. The use of appropriate look room contributes greatly to a sense of balance in the image. Be aware that the amount of look room necessary is dependent upon the angle of the subject to the camera. A subject looking directly toward the camera will require less look room than a subject shot in full profile. Headroom is another element you should consider when framing your subject. Headroom is the amount of space between the top of the insect’s head and the top of the frame. If you leave too much space, the subject will appear as if sinking in quicksand. If you don’t leave enough room, the subject will seem in danger of bumping its head. The eye of the hunting bug is placed in one of the intersecting points. Common Damsel Bug: Magnification 10, f/8, ISO 100 and 1/250 sec. The rule of thirds states than an image is most pleasing when its subject is composed along imaginary lines which divide the image into thirds — both vertically and horizontally. It is actually quite amazing that a rule so seemingly mathematical can be applied to something as varied and subjective as a photograph. But it works, and surprisingly well. The rule of thirds is all about creating the right aesthetic trade-offs. It often creates a sense of balance — without making the image appear too static — and a sense of complexity — without making the image look too busy. Before taking a photo, imagine the grid in your head and play around with composition until you get something that works. If you’ve already taken the photo then try cropping it to meet this rule, most editing software will have a grid you can overlay on your image to help. Does this mean that you need to worry about perfectly aligning everything with the thirds of an image? Not necessarily — it’s just a rough guideline. What’s usually most important is that your main subject isn’t always in the direct middle of the photograph. 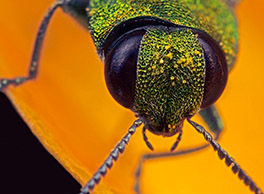 In macrophotography and microphotography, the background is often so out of focus that it appears as a solid or smoothly varying patch of color. The color of the background, as one would imagine, plays a significant role in emphasizing the subject. It’s important to choose a background which complements the color and tone of your foreground subject. Doing so brings out the subject by emphasizing its own colors. Fortunately, one can often pick a different background by simply shifting the camera’s vantage point. Capturing striking colors, and combinations of colors, is just as important in the micro world as it is in everyday photography. One should also take care to avoid placing distracting out-of-focus highlights behind the subject. A related issue is the brightness level of the background. A background having similar brightness to that of the subject will of course create less contrast in comparison to a background which is brighter or darker. Keep in mind that your main subject must stand out while composing a shot. Try to refrain from creating a background which is too bright or too dark, as that can throw the image out of balance. Leading lines naturally control the eye movement of the viewer. Our eyes naturally follow the path of a line, and you can make use of this knowledge in your composition by placing the main subject of interest at the end of the line where our eyes will rest. Whether they are graceful curves or dynamic diagonals, all lines should lead the viewer’s eye to a specific area within the photo that is an important focal point. Leading lines are a key element of composition. Learning to use them effectively comes by learning to “see” lines. But, be careful with the use of leading lines. They can also work against you by directing the eye away from the subject. Just as there are times when guidelines are helpful, there are times when they can be modified or ignored altogether. Knowing when to ignore the guidelines requires some experience, but the results can be quite surprising. By far the biggest challenge to microphotography in the field is getting enough light on the subject. Light is lost when using macro lenses, extension tubes and teleconverters. As magnification increases, depth of field decreases rapidly. Due to loss of light and depth of field considerations, it is advisable to use a ring flash or twin flash when shooting micros. It will allow you to shoot at a reasonable speed, yet enable you to use a small aperture for sufficient depth of field and a fast shutter speed (e.g. 1/200 sec) to capture moving insects. It becomes a necessity for most shooting above magnification 1:1 simply because there is normally not enough light. Front lighting will provide better color saturation, while side lighting gives your subject more light on one side than the other. This gives the picture a greater sense of depth and dimension even though it’s a two-dimensional image. A ring flash will provide an even level of lighting so that your image won’t have strong highlights and shadows, but the downside is that this often looks unrealistic because the flat front lighting produces a flat appearance. A twin-flash system will produce a more natural lighting situation and the results are often more appealing because there is more dimensionality to the image. Being able to choose the position of twin-flash units allows you to mix front lighting with side lighting. Twin-flash units also allow you to change the output levels of light. One flash may be brighter than the other, giving you much wider latitude for creating more natural shading and a greater sense of depth. The two flash tubes/heads can also be independently rotated around the lens rim to adjust the location of highlights and shadows, thus better matching the shooting situation and creative intentions of the photographer. Getting the light just right is never simple. While single or twin-flash units give us the opportunity to add light, sometimes, even with controls that allow us to vary the light output, the added light is still too harsh. To soften the light, you can choose to use flash diffusers. Diffusers are translucent plastic covers placed over the flash head so the light passes through them, softening the light. 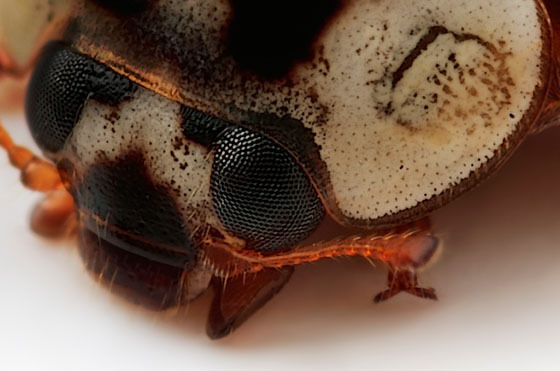 Most macro lenses are maximally able to capture a 1:1 life-size image of a subject on the camera’s sensor. Strictly speaking, a lens is categorized as a macro lens only if it can achieve this 1:1 magnification. At 1:1 life-size, the size of the subject on the sensor is as big as it is in real life. A lens’s minimum focusing distance is the closest distance your macro lens will allow you to get to your subject while still maintaining sharp focus. A low-budget method to decrease the minimum focusing distance is to extend the distance between the lens and the sensor by inserting extension tubes or a continuously adjustable bellows. The further the lens is from the sensor, the closer the minimum focusing distance, and the greater the magnification. Tubes of various lengths can be stacked, decreasing lens-to-subject distance and increasing magnification. Extension tubes and bellows can be used for different lenses. By adding a teleconverter, an even greater magnification can be achieved. Placing an auxiliary close-up lens (or close-up “filter”) in front of a macro lens is another option. Inexpensive screw-in or slip-on attachments provide close-focusing at a very low cost. An interesting alternative is the reverse lens technique, which can be accomplished by mounting a lens with a certain focal length in reverse, in front of a normally mounted lens of greater focal length, using a macro coupler which screws into the front filter threads of both lenses. Another great post! Thanks so much for so generously sharing your insight, knowledge and experience. Thank you kindly for a very interesting article and generously sharing your knowledge.